Located in the Hameau des Marmottes, at 1750 meters, this new chalet offers a magnificent view of the mountains and valley. The 7 comfortable rooms offer you calm and refreshing rest enjoyed. Two bedrooms have their own bathroom. Upstairs is a bathroom and a bathroom communees serve the three bedrooms. On the ground floor, a bathroom is shared between two rooms. More than 4500 m2 of leisure areas covered for you. Open daily from 9:15 a.m. to 9:00 p.m.
relaxation area in an exotic, swimming pool, saunas, steam baths, jacuzzis, relaxation solarium, Turkish showers, aerobics, pregnant women activities, adult swimming and baby swimmer ... lessons suitable for all. Swimming pool open from 11h30 to 20h. Aquaclub (except swimming pool) open from 11:30 a.m. to 9:00 p.m.
For mountain holiday combining fitness and wellness. Open Monday to Friday from 10am to 12pm and from 14h to 21h Saturday and Sunday from 15h to 20h. Nature racket - From easy walk to the great day hiking to the Valley at the foot of the glacier, the weekly program of Raquette Nature offers many discoveries. Located in the district of La Croisette, this structure carved in the snow is a delight for lovers of small shovel sledge descents. 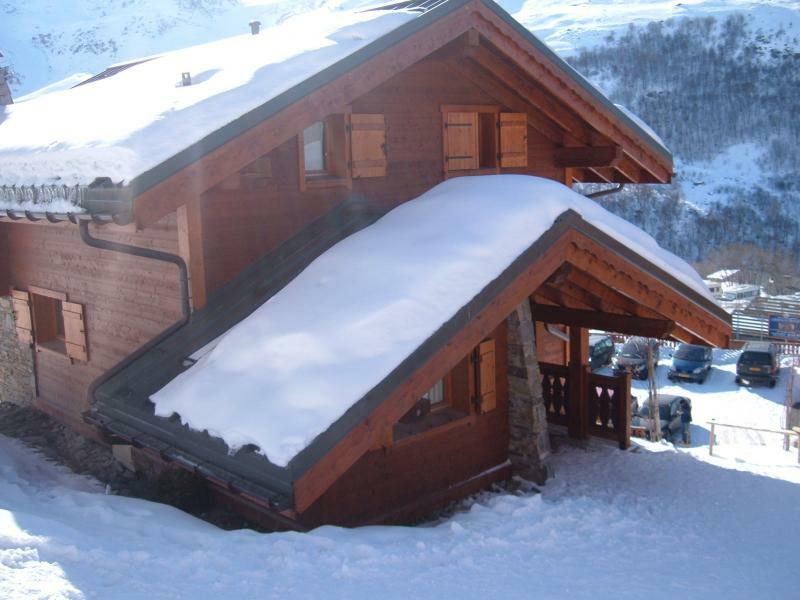 Located at the entrance of the center of Les Menuires, the chalet is south facing and quiet. Ski: Located at 1,800 m, the chalet allows you to leave (20 m) and ski back foot to explore the vast area of ? ?the three largest in the world valleys. Smaller and beginners can take the free shuttle to the center 30 m serving and facilitating access to the first ski lessons. Once access to the blue runs, you will be on skis in the area of ? ?Les Menuires with different orientations, slopes and snow types depending on sunlight and time of day. The more experienced can easily turn on the areas of Val Thorens and Meribel. Experienced skiers will be happy to make a return trip in the day in Courchevel. Most of you will remain on Les Menuires offering 33 lifts, 77 runs (12 green, 35 blue, 24 red, 6 black) 1 toboggan run and four Nordic trails. Rated family resort, you'll find there to delight your children. Arriving at MENUIRES, at the roundabout turn right towards Val Thorens. THE FIRST soon take left, go left under the bridge. 100m to park and right on the small parking time unload the car. With this high-end accommodation, we spent a very relaxing holiday. Everything is very well arranged. We felt "home ". Each his bedroom and bathroom. A cupboard to dry ski boots, this is awesome. The blue track at 10 meters from the house. A garage for the car. Heavy snow, and 2 days of sun a successful holiday. Beautiful and large chalet with stunning views over the Massif des Masses. Accessible on skis. Little more comfort: cabinet for drying ski boots! A counselor for a group or family! Thank you for your comment. Since your visit we installed a pro livebox allowing everyone to receive the free wifi throughout the chalet. The Chalet is perfect with a large living room and numerous bathrooms and storage space in all rooms. Kitchen equipment / dishes are largely sufficient. Access to the slopes is fast (2 min walk), the return from the slopes. Ski rental, delivery of bread and restaurants in the immediate vicinity of the cottage which is extremely convenient! Please note, access to the center of the slightly longer station (or bus or cable car after a little walk).